Many women suffer from a profound fear of childbirth at some point in their pregnancies, and for one simple reason: Anxiety flourishes in the absence of personal experience. How will I survive the pain? women may wonder. Will I spit profanities at my partner during labor? Will I humiliate myself? And, most important: Will the baby be OK? For the first-time mother, the birth experience is the great unexplored territory, the mysterious biological rite of passage she must pass through before she will, with baby born and safely in arms, be christened mother. Pregnant women have months to contemplate, prepare for and worry about childbirth, and for many, fear of pain takes center stage. External influences don’t necessarily help: Movies and television, for example, often portray the birthing mother as a screaming banshee — hardly a comforting or realistic image. But many first labors take hours, with many of those hours spent walking the hospital halls, napping and chewing on ice chips. This fear of pain prompts many pregnant women to make an early and firm decision to rely on pain-relieving medication during labor. In fact, the percentage of women choosing epidurals or spinal injections during labor in large hospitals tripled from 22 to 66 percent between 1981 and 1997, says Joy Hawkins, M.D., who gathered these figures and is director of obstetric anesthesia at the University of Colorado School of Medicine. Another reason for fear: “Our lifestyle doesn’t expose us to the birth of babies,” says Leslie Hartley Gise, M.D., a clinical professor of psychiatry at the John A. Burns School of Medicine at the University of Hawaii at Manoa in Honolulu. Not knowing exactly when childbirth will occur can add to the anxiety. Tilda Richardson, 40, of Phoenix welcomed delivery by scheduled Cesarean section because she would know when the birth would occur and would also be able to avoid what she considered the messiness of labor. 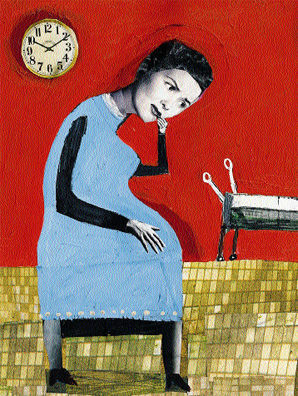 For some women, fear of embarrassment can reach unbearable proportions as the due date nears. “I feared that my body would take control and I was not going to be able to stop it and this baby was going to have to come out,” says Cramer. This fear was compounded by friends’ tales of loss of bowel control on the delivery bed. Three days before she was scheduled to be induced (she had lupus and her amniotic fluid was low), Cramer began drinking only clear liquids and taking Metamucil and, finally, she asked for an enema. Such practical solutions, as well as reading up on pain-management choices, requesting appropriate fetal tests and talking to other mothers, can ease the fear of childbirth. Ultimately, women learn that it doesn’t matter so much how you get through labor, but that you do — and that there is a baby waiting for you at the end. “When I heard her cry and the pediatrician say she was perfect, I thought, ‘Oh, thank God,’” recalls Cramer. Fear of the baby being deformed Remember that most babies are born healthy. The March of Dimes reports that of the nearly 4 million babies born each year, about 96 percent are born free of serious birth defects.